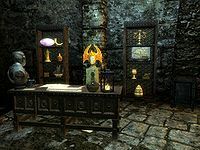 Like any trade guild, the Thieves Guild is an organization of professionals, except that in this case the professionals are burglars, robbers, pickpockets, smugglers, and other enterprising operators. 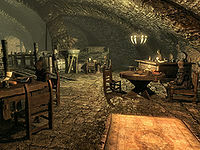 They typically don't have public guild halls, but sometimes have safe-houses, and members tend to gather at a single location in large towns, such as at a cornerclub, inn, or tavern. Typically, members are bound not to rob each other, kill anyone while thieving, or rob the poor. 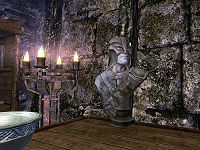 The Thieves Guild usually has the resources to bribe officials, establish a black market of stolen goods, and maintain a network of informants.For historical information, see the Lore article. Note: If you quicksave immediately after the dialogue ends, and before the quest is displayed on screen, you can quickload until you get a quest in the city you want. This can be useful if you want to focus your efforts on cities in which you have not yet completed restoring the Guild's status. You can also simply quit the quests, which will be marked as failed in your journal, then select new ones. You can do this an infinite number of times with no consequences. † This quest unlocks access to a Thieves Guild fence. When quitting a Fishing Job for Delvin, if you have the same type of item you were told to pickpocket in your inventory at the time of quitting, but did not obtain it from the mark, the item will be removed from your inventory regardless. If you break into Mercer's house and take Mercer's plans before starting the quest The Pursuit, you will glitch the game and the quest will not start. If you still have the plans on you, you can continue. 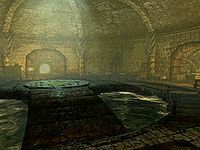 Prior to giving the rubbing to Enthir and talking to Karliah to finish the previous quest, drop the plans in the room, then finish the conversations. Once "The Pursuit" has been triggered, do not pick up Mercer's Plans. Finish breaking into Mercer's house. Once the quest directs you to find evidence, go back to the inn and pick up the plans (which will be a quest item from the onset of the quest being given). 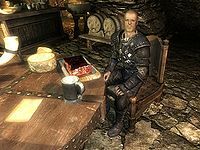 The miscellaneous objective marked "Talk to Brynjolf about joining the Thieves Guild" may not disappear after talking to Brynjolf. After you become a member of the guild, the marker does not go away. To fix this, use the console command setstage TG00MaulHandler 200. When speaking to Vex or Delvin about radiant quests, the dialogue option "I hear you're offering extra work." may continue to appear even after completing a job. Esta página foi modificada pela última vez à(s) 07h53min de 19 de fevereiro de 2016.